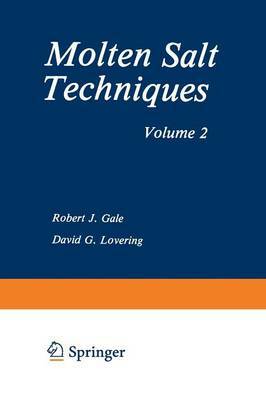 This second volume carries on the excellent work of its predecessor, ex- tending its scope to other melts and to other techniques. It continues to present first-hand understanding and experience of this difficult and demanding field. There is ever present the trade-off or reconciliation between the novel chemistry of systems not dominated by the mediating influence of a supposedly indifferent solvent and the high temperatures required to effect the fluidity of the system. At the limit, the very high temperatures so increase the rates of all reactions as to dissolve the temporal difference between the thermodynamic and the kinetic view of chemistry. What can happen will happen and invariably does happen. Vessels corrode, the apparatus becomes a reactant, and the number of tolerant materials able to withstand the attack shrinks to graphite, boron carbide or, if all else fails, to frozen parts of the molten salt itself. It is probably true that there is no limit to man's ingenuity but I believe that God gave us molten salts just to test that thesis. If there is ever a Molten Salt Club, and Englishmen love clubs, its membership will be exclusive. It would certainly include the authors of this series. Graham Hills University of Strathclyde ix Preface In the first volume of this series, we expressed our contention that a real need existed for practical guidance in the field of molten salt experimentation.